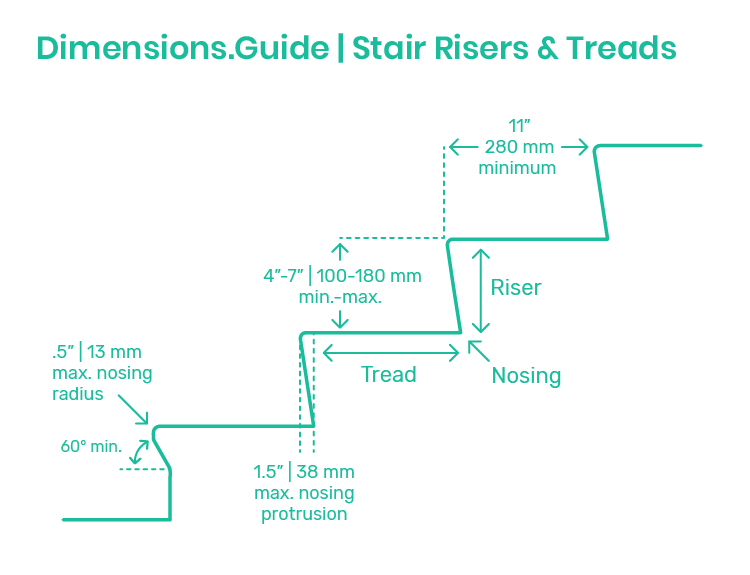 Responding to the movement of the human body, the sizes and relationships of stair risers and treads are regulated to make vertical motion safe and easy. Steep stairs make climbing more tiring and dangerous, while shallow stairs are awkward and inefficient for our human stride. Buildings codes have been created to control the minimum and maximum measurements of risers and treads. Riser Height: 4" | 100 mm min. ; 7" | 180 mm max. Tread Depth: 11" | 280 mm min. Nosing Protrusion: 1.5" | 38 mm max. Nosing Radius: .5" | 13 mm max.